Affordable Accoutrements: Dinner Party, circa 1961! It's time for Tablescape Thursday, hosted by the inimitable Susan of Between Naps on the Porch! Be certain to visit Susan and all her talented participating guests. The tables are set; let the fun begin! 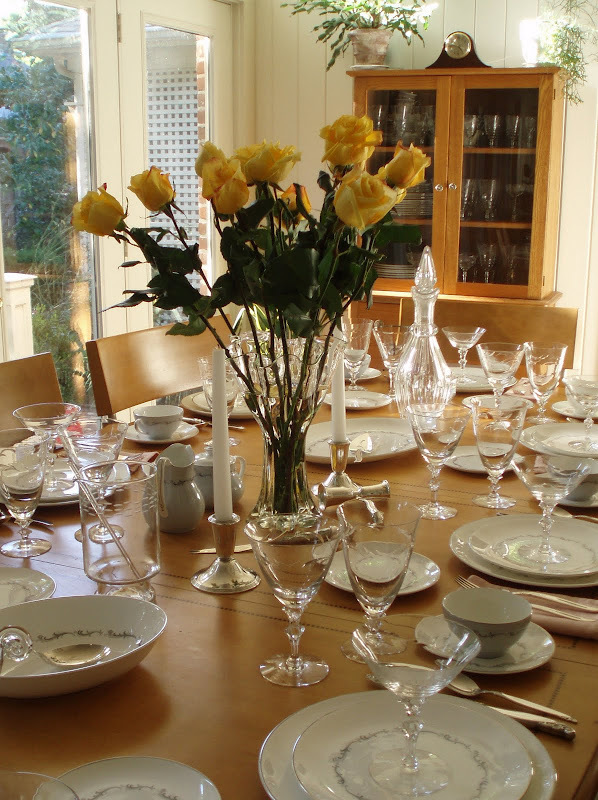 I had already selected the china, crystal, and silver for this week's table. The one I set for you last week included items that might have been chosen by a bride of the 1930s. I decided to move forward a quarter century to the early 1960s. Then, in a comment on "1930s Dinner Party," Bonnie of Diamonds & Daisies suggested that I do a post inspired by a Mad Men cocktail party. Mad Men, as I'm sure you all know, is the award-winning program on the AMC Network about advertising executives set in the early 1960s. "From the clothes and hairstyles to the incessant smoking and ludicrously dated social codes, Mad Men serves as a time capsule for the middle of the last century, and food and drinks play a particularly prominent role in recreating the period." There's an inordinate amount of boozing on Mad Men—it seems as if someone pours a cocktail in just about every scene. We're back in the solarium this week. No tablecloth or placemats ... just clean modern lines. The flatware is one of those "love it or hate it" mid-century patterns, "Leilani" by 1847 Rogers Brothers (1961). I happen to like it. I enjoy the way the tips of the handles curve inward toward the plate. The crystal is "Linda" by Tiffin (1960-1973). The china pattern is "Coronet" by Royal Doulton (1957-1979). The china and crystal were displayed together in a china cabinet at an estate sale. The first day of the sale, I purchased the glassware. It seemed a shame for it to be separated from the china (after almost 50 years together! ), so I went back the second day and bought the dishes. The grand total was just under $80. The white peacock painting from last week's post has been returned to the bedroom. 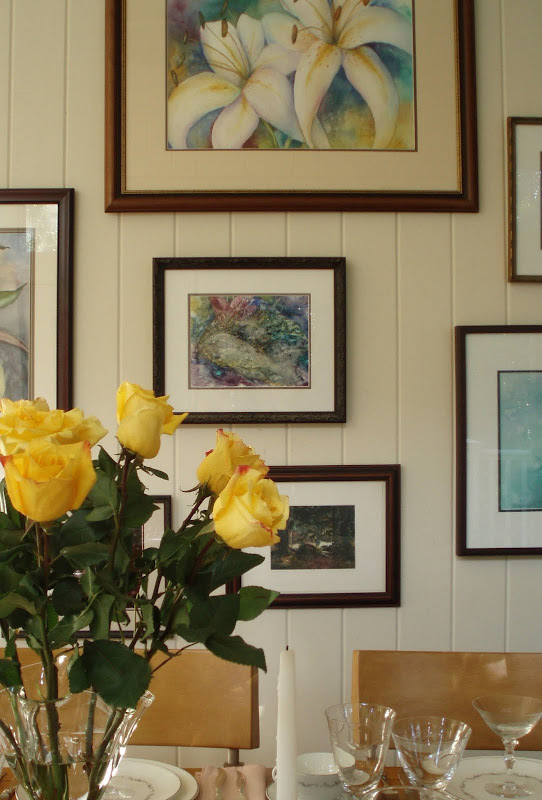 The "usual" is back in this room (mostly watercolor paintings I did a few years back). I needed a centerpiece FAST ... I was trying to get pictures taken before I lost the light. I ran in the supermarket on the way home from work and selected these roses from a group that had been reduced to $2.99. I didn't even re-cut the stems ...just put them in water and let the vase "arrange" them. It's a vintage "carnation vase" perfect for any type of long-stemmed flowers. Since we're thinking Mad Men, there must be cocktails! 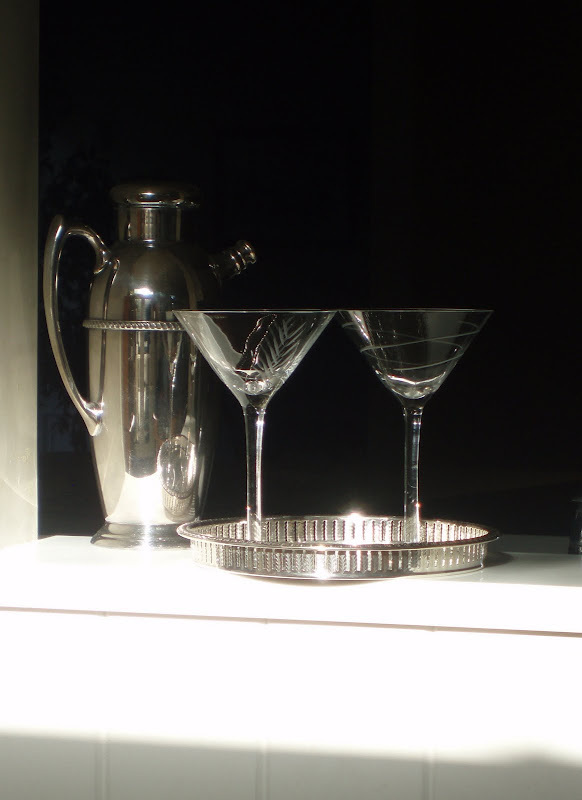 Here we have a vintage silverplated shaker and martini glasses in a classic shape, updated with etched chevron and swirl patterns. 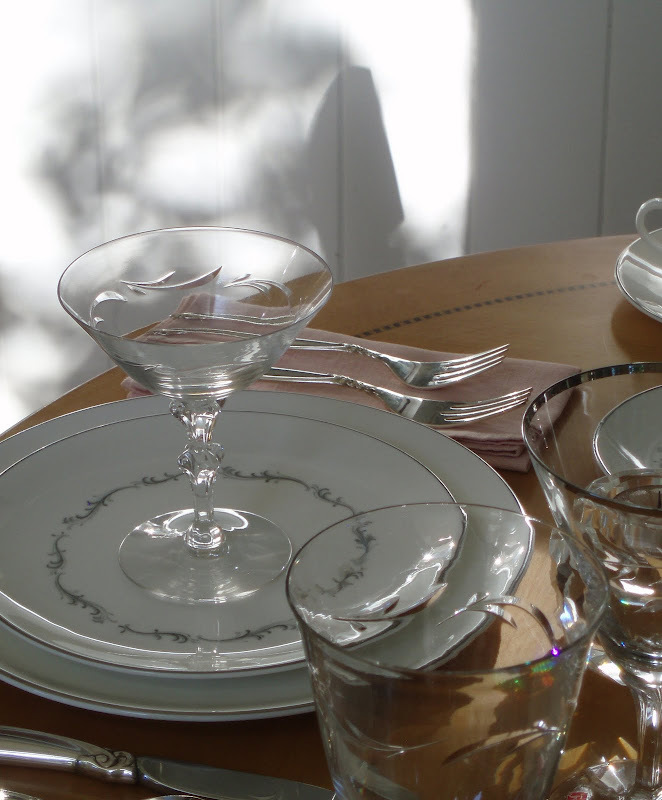 The glasses are presented on a silverplated gallery tray. All the items came from thrift stores or estate sales. Dirty martinis are on the "approved" list of AMC's Mad Men cocktail guide HERE. I substituted vodka for gin (I know ... heresy to purists, but vodka has pretty much supplanted the role of gin in recent decades). It's in a four-to-one ratio with dry vermouth. The "dirty" comes from olive brine, added to taste. I like three olives in mine. As did (famously) James Bond in 1960s films, I prefer a martini "shaken, not stirred." I like the phenomenon that happens when bright sunlight makes solid objects appear near-transparent. I lacked one glass having eight three-piece place settings. I looked through the odds-and-ends in the crystal/silver closet and found this vintage Fostoria glass (the knife blade is pointing toward it). It has a similar height, shape, and clarity to the rest of the crystal. The original Fostoria label is still attached (and it cost only 99 cents at Goodwill!). It could be considered the special glass for a guest of honor (how's that for spin?). Day's end approaches ... time to light the candles. I used tealights in faceted holders at the end place settings and, along each side, placed the candles in simple vintage tall sherbet (or champagne!) glasses. The candleholders are sterling ($5 for the pair on the last day of an estate sale). Here, I experimented with turning on the overhead light. It adds warmth, doesn't it? I like the effect of the candles "up lighting" the roses. To further the "thirsty" Mad Men theme, I placed some vintage silverplated bar tools beside the vase. And for those who perfer a stirred martini .... see lower left (I'm SO careful with that glass stirring stick!). A vintage glass ice bucket monogrammed with an "S." Not my initial ... but does that really matter? 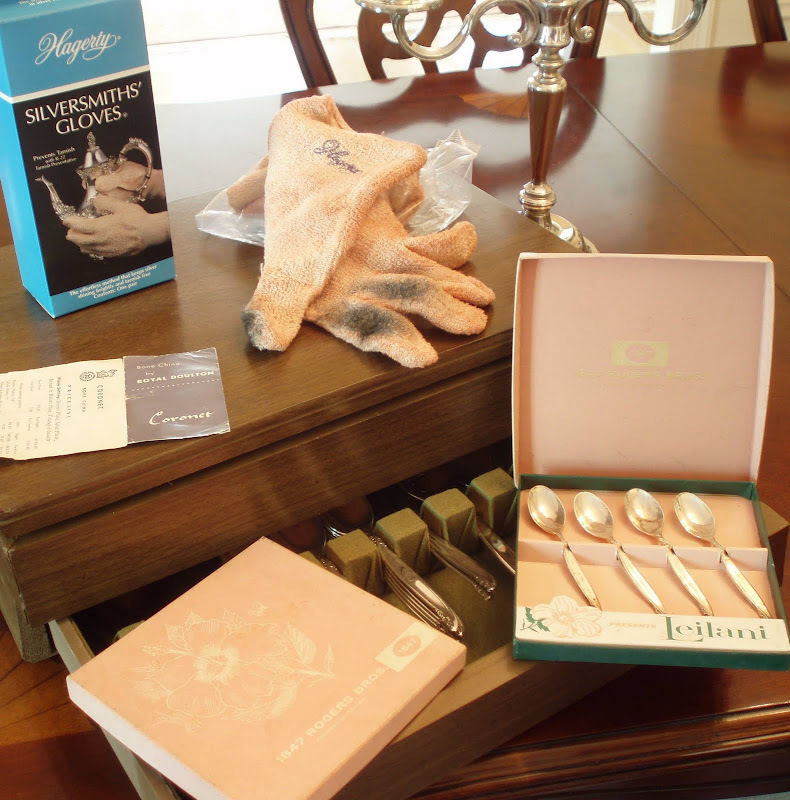 For a quick polish (as I did when I set the table with the Leilani flatware), these Hagerty Silversmiths' Gloves work well. They don't take the place of an all-out polishing, but they do work as the package describes. They cost around $15 for a pair. The Leilani silverware came in this mid-century flatware chest (labeled 1847 Rogers Bros.). I purchased a large set on eBay for a very reasonable price (under $50, including shipping). It was in "barely used, if at all" condition. The Leilani demitasse spoons were another eBay purchase. Even though they weren't needed in this tablescape, I wanted you to see them. I think they're pretty adorable! The Royal Doulton printed piece includes prices. It's interesting to think how they relate to an average salary in 1961. Entertaining stylishly was not an inexpensive pursuit! Perhaps I'd better call a cab ... just to be on the safe side! Ohhh my...so beautiful and you're right...so 60's! I love it! What a lovely room and the perfect setting for a tablescape...your conservatory...absolutely gorgeous! And...before I forget, wanted to mention that your water colors are fabulous! Do you still paint? What a bargain...to acquire all that beautiful crystal and china for under $80...fabulous!!! I love this pattern by Royal Doulton...it's so elegant in it silvery simplicity! Really...there is nothing that can compare to a table done in white, silver, and crystal! The beautiful vase of long stemmed yellow roses is the "icing on the cake"...one sweet splash of color!!! Very well done, my friend!!! I really enjoyed your fine table and your photos are gorgeous! I especially like the night views!!! Bill, They really knew how to live it up back in the day, didn't they? I wish people still entertained. Sometimes I feel that I am the only one throwing dinner or cocktail parties. I think I was born in the wrong era! Your table is lovely! Truly reminiscent of the 60's. oh, and I love "Mad Men!" Really nice! Maybe S can represent "Shaken" or "Stirred" so all your bases are covered! I think the flatware pattern is quite beautiful. They go well with the curves in the plate pattern, and the knobs on the stemware. The table setting is in keeping with your usual impeccable taste. As for Mad Men, some of the people have lovely things, but no one seems comfortable with life, their surroundings or with themselves. First of all after a couple martinis no one will notice one of the wine glasses doesn't match. I love the music from the 60's. Rock that is. Now what would they have served? You have really developed into quite the tablescape photographer. Do people come over and wonder why the table is always set so nicely? Sheer perfection, Bill! You are inspiring me to put together a night time scape. The candlelight is amazing! I also like the bright light effect. Beautiful!! Would love to sit at a table like that with good company and conversation. Never mind the martini - I will have wine. :-) I think it is great that you have such a wonderful knowledge of the pieces you purchase. Ahhh! 1961 - remember it well!! I have not watched Mad Men - need to check it out. Bill - you always have such beautiful -- and thanks to you, I've overcome my fear of "mis-matched" glasses. I even picked up a beautiful lone etched goblet last week at GoodWill...I'll have to post it so you can tell me what the pattern is .. now I just need to find 5 more that will coordinate somewhat. I think this is my favorite tablescape of yours (well, maybe second to the family Bible one), it's beautiful, so elegant. 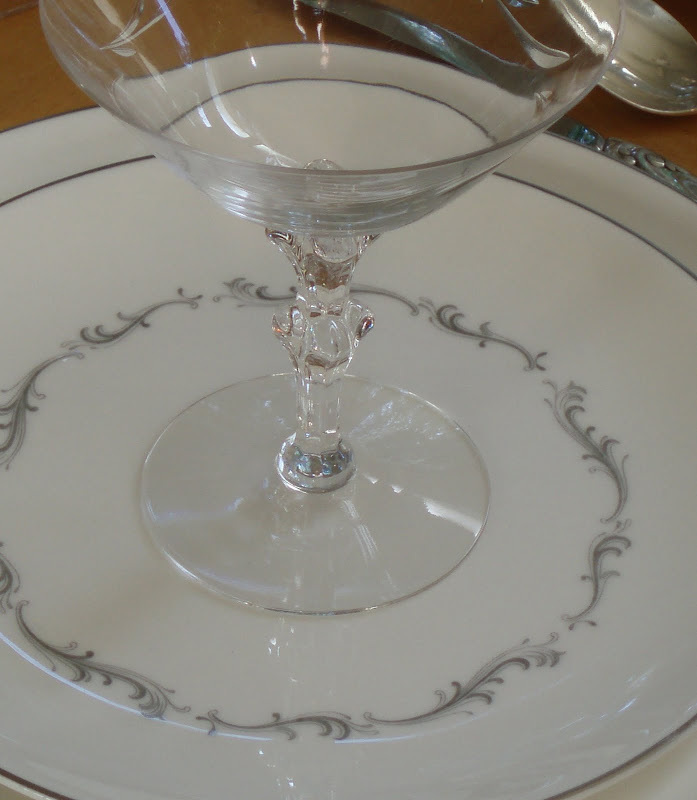 The pattern on the dishes is so pretty and it mixes so well with the pattern of both the crystal and silver (LOVE it! ), and I loved the pink napkins with it all! Your barware is wonderful! You have so many unique and interesting pieces. (Be careful with the tealights in the crystal glasses, the heat sometimes causes them to shatter, I learned that the hard way). Another beautiful tablescape. You are certainly very knowledgeable about your accoutrements, and a talented artist as well. The watercolours are beautiful! Please give us a closer look at them! Bill -- I think you nailed the 60's! Great table! Bill, Big smile here on my face...I love this tablescape. It sings to me of my childhood and I am sure that your solarium is my favorite place for a dinner. Also, I like my martini's dry, vodka with an olive or a twist. My husband is the purist...gin all the way. Your posts make me so happy!! You are very talented at perfecting the right look for a tablescape from a certain era and have done a great job at this 60's one! Love the candlelit pics! I am safe to drive - not a martini girl....but not ready to leave!! Your table is gorgeous. I have a vase very similar to your...it was my mother's. You did a fab tablescape for the 60's...I am sure way better than "they" would have done it back then!! Oh Bill, I love coming to see your table settings that always have WOW factor. The yellow roses just blew me away. BTW, you got a fabulous deal on that china and crystal. Unbelievable for sure. I loved your own artwork as well and was not surprised at your talent. I always enjoy visiting your blog. Thank you so much for sharing your talents. Ah, the 60's...beautiful tablescape, Bill! It's beautiful, Bill! It definitely is very 60's. In fact, we had similar china and flatware at home when I was growing up. It looks fantastic with the soft glow of the candles, too! Yellow roses!!! Oh, oh, oh!! This one has my name on it! Just beautiful on the wood table with no tablecloth. Love the roses by candlelight! Love it all! Could have been my mother's table. Lovely, and thanks for the memories. That is wonderful. It really captures the time, reminds me of table settings when I was a little girl and we were invited over for "fancy" dinners at friends' homes...took a little trip down memory lane. My Mom only had really ultra modern stuff from Germany, it didn't look like any of the things we saw at other's homes. You always do great work! I love visiting..
Love the tablescape and love Mad Men! While most of us (ahem)center our tablescapes around the seasons, you do a magnificent job portraying the big times in our pop culture. I love it. Sorry to say I have not seen Mad Men (I should), but I am big on Jmaes Bond. That said, everything is stunning. You have made some incredible scores at these estate sales. This must be a part time job for you!! Another successful party, Bill!! Glad I could make it! It's a treat to see what you'll display for Tablescape Thursday. This was really nice and as the lighting changed, the candles were lovely as to what they did for the mood and shine. Gor-gee-ous, Bill! The china is beautiful as are the goblets and dessert goblets...the yellow roses with the glow of the votive candles in the dark is outstanding. Love those silver polishing gloves...I use them all the time for my silver teaset. Love your pictures...they are getting better all the time. Just beautiful! Just beautiful! Man you have a lot of collections!!! Love the stemware. The flatware is really neat - it's so different than anything out there today. You're always one of the first that I look at on Tablescape Thursday. Always a treat. You do not disappoint! Hi Bill, the table looks so soft and elegant. You always stun me with your knowledge of dates and makers of all your wonderfully beautiful china and glassware. Amazing! Bill, I always love what you do with a table. Yours are always so sparkly. Wish I could find such fantastic estate sales. Just not that classy out here in the Big Valley, CA or everyone just passes down what they have. I enjoyed my visit to your dinner party today. I loved the different lights and mood with candles versus sunlight. A martini will be lovely ~ thanks. The yellow roses are lovely. Bill, I just LOVE your period tablescapes. I always say I'm an old soul that should have been a teen in the '50s or '60s. 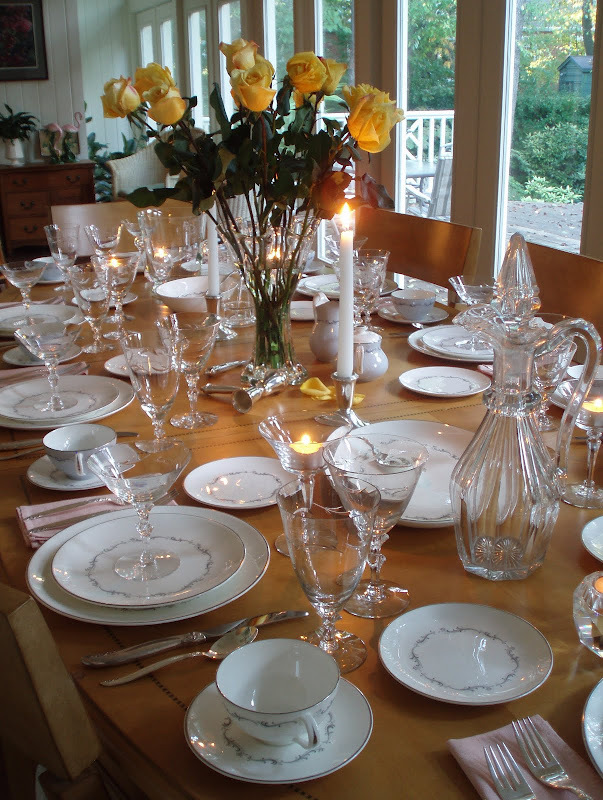 Your beautiful table is an explosion of wonderful china and crystal. Love the touch of yellow with the roses. I love how the graceful swirls on the china, glassware, and silver all compliment each other. Very simple and elegant. and, your humor is just adorable! Beautiful! Lovely as always! Charming and warm, I loved it. I added as a follower, Stop by and visit me soon. I am reminded of the rare formal dinner parties my parents had. There was that same sparkle to Mom's tables. It always captured my imagination and lit the spark that has fueled my love of entertaining and tablescaping. Thank you for continuing to feed that spark...in all of us. Hi Bill, Gorgeously 60s for sure! Mad Men, one of my fav shows! And hey, I need my crystal stemware back,tee hee! Love the roses. Another great tablescape. I had to look up what "flatware" was as I had never heard that word before here in the UK. I love the way you have these great Estate sales and yard sales and pick up such great bargains of such excellent quality. The 60's to me was mini skirts and the Beatles, leaving school and going to train as a Nursery Nurse. It is lovely to see the finer way of life as it was then and really it is as beautiful today on your table as it was in the 60's. Thank you for sharing. Beautiful table, I loved all the silver and white together. You have found some wondeful bargains. The yellow roses were just to pretty, my favorite color of rose. Hello Bill! Your table is gorgeous! I know you might not believe this but I just packed the matching cups and saucers to this dish set! I do not have the plates or accompanying pieces but I have a friend that does ;)( I mean you lol) Your table turned out so beautiful and the silverware is very beautiful too!! HI Bill. This tablescape in an other beauty. The way you work with china, glasses ,silver and of course flowers is marvelous. And you paint too? Wow. How fun, Bill! This is a wonderful depiction of a bygone era. We were on the same wavelength this week. 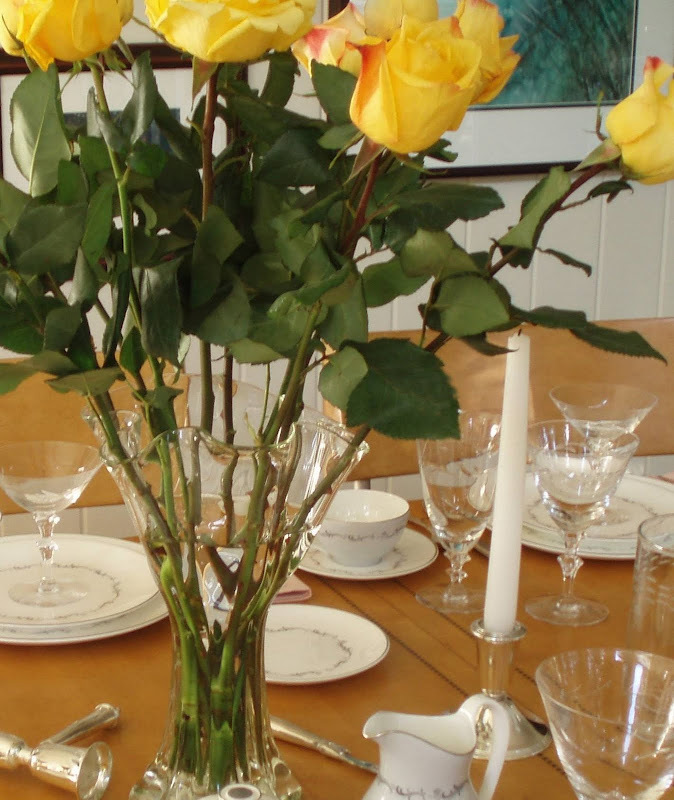 Same yellow roses at my house, similar 60's crystal stemware, goblet centered on the salad plate, no tablecloths or placemats here either....even down to the white candles. :) Great minds~same track! What a treat to get to see some of your watercolors. You are muli-talented & a true Renaissance man. You continue to be a wealth of information each week. I can't tell you how much I enjoy your postings & look forward to Thursdays, just to see what you've created for us. BRAVO!! Lovely as usual! I love the vase and will be on the look out for one of those on my treasure hunts. Thanks for sharing and have a great day! I must admit, I've haven't seen Mad Men, although I've heard about it, nor have I had a Martini, but I am so wrapped up in this table! I am really glad you kept the set together too, it looks great and I love the silverware! You've done a great job! Hi Bill! Oh my word, I almost forgot to breathe taking in all of that gorgeous-ness! Love the silverware, china and crystal! That table is simply perfect! Glad I joined in this week! Hello Bill, Entertaining as always. I adore the stemware with the cuts on the stems. I am coming to your town for a visit. We don't have estate sales here like you do, nothing so elegant as this. I'll be right over in my '61 pale yellow GTO. I dream of this car. Bill, It's obvious that we all love your posts! You brought back a memory for me. This was my cousin's wedding china and I can remember making several trips to the store where she was registered ... to see how much of it was being purchased as gifts! How funny! Love your post ... hope you'll drop by to see my "country" stuff! I so enjoyed your 1961 dinner party! I adore the flatware of the Roger Brothers! Bill, they need you as a set designer! You'd be perfect. This is lovely as always. And you're a painter as well! What a talented man. So beautiful...looks like the table at a wedding dinner! Mad Men is my very favorite show! I love how you did this table. And so happy that you did not put the dirty ashtrays on it! LOL Really...how did these people manage to get any work done with all that alcohol consumption going on. Bill...very beautiful (as usual). The china reminds me very much of my Mom's (who was married in 1959). Every Thursday, your Tablescape is the first one I look at! Imagine my surprise today when I saw that you had featured my wedding china pattern (1964)!! I'm so jealous! I only managed 2 full place settings, so hubby & I saved it for candlelight dinners on our anniversary each year. You've set such an exquisite table, as always, with an array of stunning photos in various lightings and angles. They are always wonderful, but this has to be my favorite! Oh my that is such an elegant tablescape. You have done a wonderful job its gorgeous. I just found you via Edie Marias attic and so happy I have, your blog is wonderful and extremely inviting. Stop by and see me sometime. Have a wonderful weekend. Your tables are the best! Always so beautifully put together and I always learn something new when reading your posts. What a beautiful table! Love it! Especially the night time shots. So lovely. Beautiful table. Love the look after dark! Hi Bill, I've been out of town this week so didn't participate in TT yesterday and just now getting around to visit. Al usual, your tablescape is amazing. I'm in awe of what must be in your china cabinet. Your 60s table took me right back to my teenage years! Loved each detail and the yellow roses were perfect. I like the way you record the table from daylight to dark. Your photos are most dramatic and wonderful to view. I always look forward to what's on your table each week. Thank you for taking the time to share these works of art. Yes, I am fine to drive..I'll be the designated driver as I am not a drinker.. But I love fine dining, and your table is FINE. I love the lines of the silver and the glasses..It all looks so pretty..timeless..
Like a cashmere blazer..always in style..
Great tablescape, Bill! The candlelight pics really sparkle! I love Hagerty's...especially the spray stuff. Great for getting into the grooves on sterling. Looks gorgeous! Loving that china pattern -- it's unbelieveable! The 60's, now your talking my era...LOL. The stem ware on those glasses are just gorgeous. As always you set a mean table, no matter what era. How do you find such bargains? If you want to see something funny from the 60's come visit me. You have a wonderful weekend Bill. I must have missed a few days! I remember this china so well. Almost picked it but instead the Essex Maroon won. 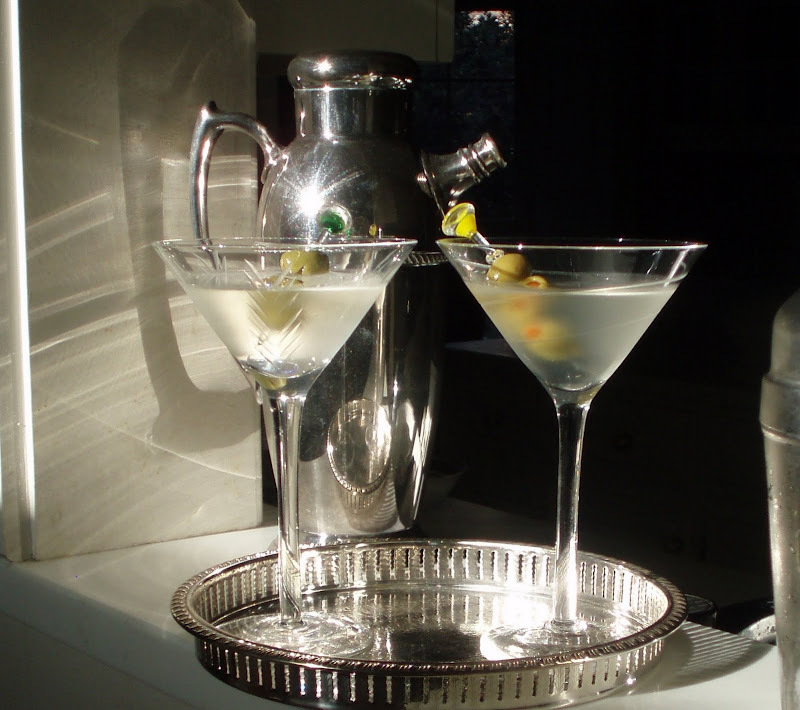 Your martini photos are wonderful. Bill, you are so dang talented!! You have impeccable taste and style, you set a gorgeous table, you cook, you can bartend, AND you paint??? This is too beautiful...just gorgeous. My. Hi Bill! -- Just checking in to say hello -- hope all is well - I've missed you! I am beginning to get a little worried since you've not posted in awhile. I pray things are ok with you...and that your dad is ok. I miss you and your beautiful postings and sweet words to all of us. We miss your wonderful posts! Bill ~ I wanted to check in on you! Haven't heard from you in awhile! Hope all is well and you are just busy! I hope your dad is alright. What a beautiful table! What are you serving? Hmmm...1961. Meatloaf? Salmon croquet? Stuffed green peppers? If it's Friday night you've wasted your efforts- that's an aluminum foil tv dinner. Hope mine's got corn and mashed potatoes! Unless it's football season. Then Daddy's frying hamburgers and we've got chocolate milk. On our way to the high school game. But I'm only 4 in 1961, so what do I know of martinis. Still don't, actually! Thanks for a beautiful evening! Thank you for beautiful table set!! What a perfect layout. This is o beautiful. Thank you. Hello !! I´am Portuguese ! but my english is not so good !! Sorry !!! But i want to say that i like very much your Layout and the pictures!! !